Easy Souvlaki Recipe For You, We Love this Easy Greek Recipe. Souvlaki, greek pronounciation soov-LAH-kee, a famous recipe from Cyprus. Traditionally made with small pieces of pork marinated, skewered and grilled on a charcoal bbq. Such an easy meal to cook. Just one of many Mediterranean recipes you will really enjoy as much as we do. In Cyprus, Greek souvlaki is really popular with tourists and Cypriots alike, One of many easy Greek pork recipes you can try at home. It’s healthy, very tasty and filling. Usually served with Greek pitta bread and fresh in season village salad ,a few herbs and a side dish of tsatziki ,, a Greek yoghurt based dip. I’m sure you’ll love it as much as we do. In Cyprus restaurants and snack bars, souvlaki is cooked and served on wooden skewers. If you use wooden skewers, soak in water for at least 5 minutes, this will stop them burning on the bbq. At home, I prefer to use long metal skewers with wooden handles, so as not to burn any fingers when turning the kebabs on the barbeque. Metal skewers also help to transfer the heat right through to the centre of the cubes of pork, which ensures the meat is cooked right through. It also cooks quicker too. I use pork shoulder because it's moist and tender. 5-6 small cubes of pork are enough per skewer. Two skewers per portion is very adequate. How I make Authentic Greek Souvlaki. 1 lb of pork shoulder cut into 1/2” cubes - (leave a little fat on the meat) it adds flavour and keeps the meat moist. Cut any large pieces of fat off the meat first. Keep just a little on the pork or to one side for placing between the pork pieces on the skewers, it help to keep the meat moist and add flavour. It can be discarded after cooking. Place the pork pieces in a shallow bowl and squeeze fresh lemon juice over it. Mix with a spoon to make sure all the pork is coated. Now grind sea salt over the meat, just a little, making sure all pieces of meat have a little salt on them. Now sprinkle oregano over the pork, stir to coat. Crush 1-2 garlic cloves into to the bowl and mix. Leave the pork to marinade for at least 15 minutes, 30 is better. Side Note In case you’re wondering why I lemon juice, it tenderises the meat, stops meat from burning on the outside before its cooked on the inside. It also helps to draw the marinade flavours into it. In a separate small bowl mix together 3-4 tbsps of virgin olive oil, crush the 1-2 garlic clove into the bowl and mix well. If you’re going to use a bbq, skewer the pork pieces, 6 to 1 metal skewer, add a little fat - optional, in between each piece of pork. If your cooking the souvlaki on a hob, use wooden skewers, their a better size for placing in a pan (with a little garlic laced olive oil). Use a pair of tongs to turn them. When you have skewered all the meat, brush the kebabs with a little garlic olive oil before cooking. The bbq will probably smoke a bit, that's okay it adds to the flavour. If there's too much smoke you may have added too much olive oil coating. If so, take the kebabs off the grill and dab with some kitchen towel to soak up the excess oil. Turn the kebabs every few minutes brushing with garlic olive oil occasional. When the kebabs is ready, 20-30 minutes, place on a warm plate. Place 1 pitta bread per person on the bbq for a few minutes on each side. They should start to swell up when ready. If cooking inside, pop the pittas in a toaster. Serve with a salad of chopped cucumber, tomato, onion and sprinkle with flat leaf parsley and fresh coriander. Add a wedge of fresh lemon to each serving of souvlaki kebabs. 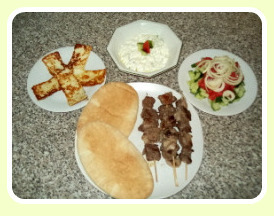 A delicious side dish to serve with your kebabs is tzatziki , Greek yogurt recipe, I love it! Spread it inside your pita bread, or pita pockets, as some like to call them, or use as a dip for these grilled pork kebabs, sliced greek bread, what ever you fancy. Homemade Garlic Bread and Greek Village Salad - Yummie!